Lightning is being blamed for at least two house fires in Collin County. Smoke and flames shot through the roof of a row of townhomes on Fawnwood Drive in west Plano at about 9:30 a.m. Friday. Officials say lightning struck of the townhomes, but the fire spread to at least four more. Neighbors heard the strike. Bob Glick said it was so close he thought it hit his home until he walked outside and saw smoke. He said he’s become increasingly concerned something like this would happen because there have been so many fires sparked by lightning in recent months. 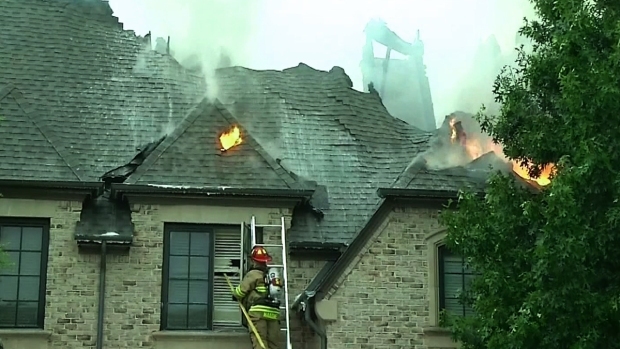 Firefighters battle a fire at Plano townhomes that were struck by lightning when thunderstorms moved through Friday morning. "We're all coming together and I think now they see how close the lightning is and I think we'll reconsider the lightning rods now,” Glick said. Shortly after firefighters began battling the flames, crews were called to another fire on Covinton Lane, about 10 miles away. "We pretty much had every unit in town on an emergency call because of the two fires we were working at the same time." Lightning is being blamed for both fires. The damage to the home on Covinton was mainly confined to the attic, firefighters say.